The spirit of harmony, the importance of the basic skills, the accurate training. Kyoichi INOUE was born in 1935 in Hokkaido. In 1955, he began to practice aikido with master Gozo SHIODA while he was studying at Chuo University. In 1970, by order of his master, he began to teach Aikido to the police department. In 1996, he retired after 25 years of work and became Director of Aikido Yoseikan Dojo. In 2010, he opened a dojo, Shinwakan, where he continues to develop Aikido. 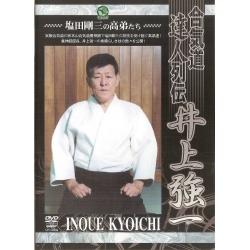 In this DVD, master INOUE, having mastered the techniques of Gozo SHIODA, explains the essence of Aikido: philosophy, techniques, etc.